Artists Chris Rutterford and Elph assessing their work while standing in front of the ADP shipping container, which houses a vast post-apocalyptic landscape viewable through tiny portholes. 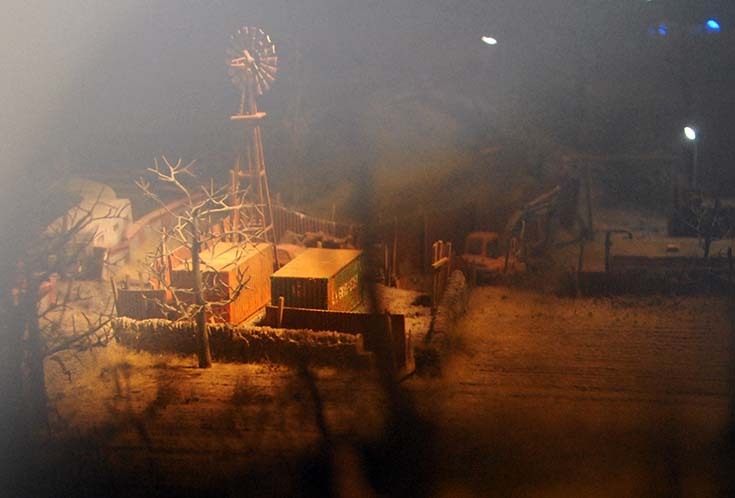 The Aftermath Dislocation Principle (ADP) is a trilogy of artworks by Jimmy Cauty on a nationwide tour across the UK – each artwork is a 1:87 scale model housed in a shipping container, which are viewed through observation ports in the sides of the containers. It was also installed at Dismaland, the temporary art project organised by street artist Banksy and constructed in the seaside resort town of Weston-super-Mare in Somerset, England in 2015. View through one of the tiny portholes into the ADP shipping container. The artwork has been touring the UK in 2016, specifically appearing in venues where there has been a history of rioting. 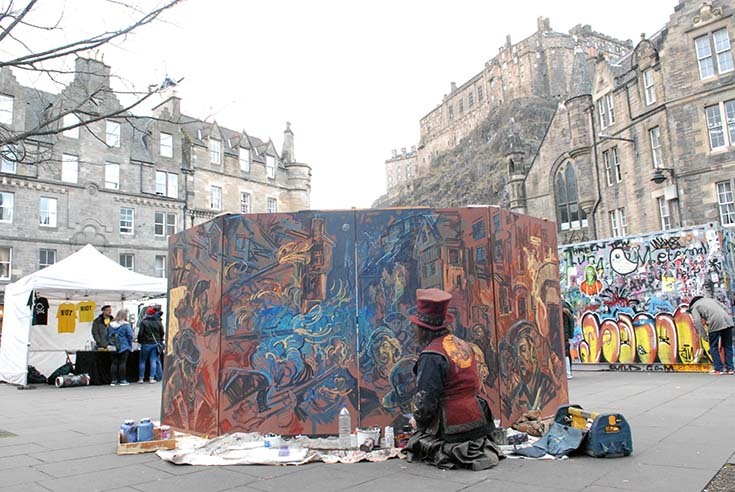 Edinburgh’s Grassmarket was chosen as one of the tours destinations as it was the scene of the 1736 Porteous Riots, when Captain John Porteous, an unpopular chief of the City Guard, was overseeing the hanging of a local smuggler Andrew Wilson. When the watching crowds began to get unruly, Captain Porteous instructed the City Guard to shoot above the crowd’s heads and they subsequently wounded local residents who were watching from tenement windows. This exacerbated the already volatile situation, at which point Porteous instructed the the City Guard to shoot into the crowd, resulting in the deaths of six people. The Porteous Mob, painted in 1855 by James Drummond, RSA FSA (1816–1877). 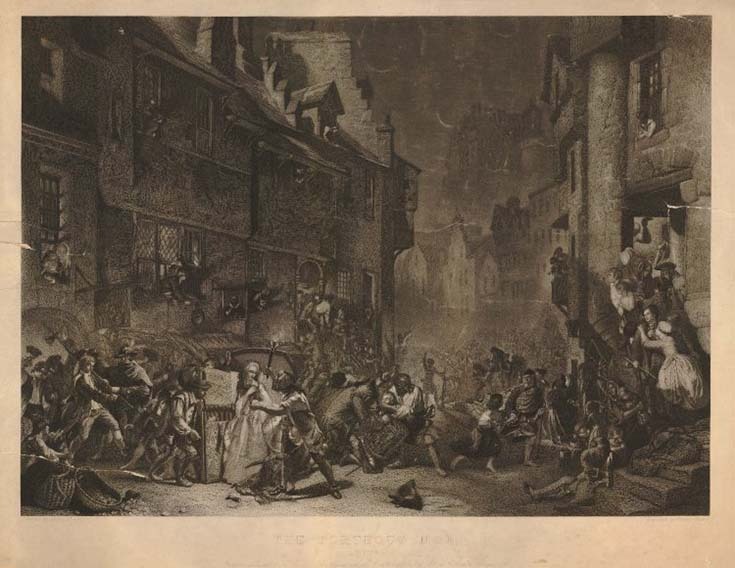 Captain Porteous was arrested for murder but after discovering that plans were afoot to arrange a pardon for him, a mob converged on the Tolbooth on the Royal Mile and he was dragged out of his prison cell and back down to the Grassmarket, where he was lynched, dying a deeply unpleasant death. Captain Porteous was buried in the adjacent Greyfriars Kirkyard in a grave marked with a simple ‘P’. This was replaced in 1973 by a stone bearing his full name and the moniker ‘All passion spent’. 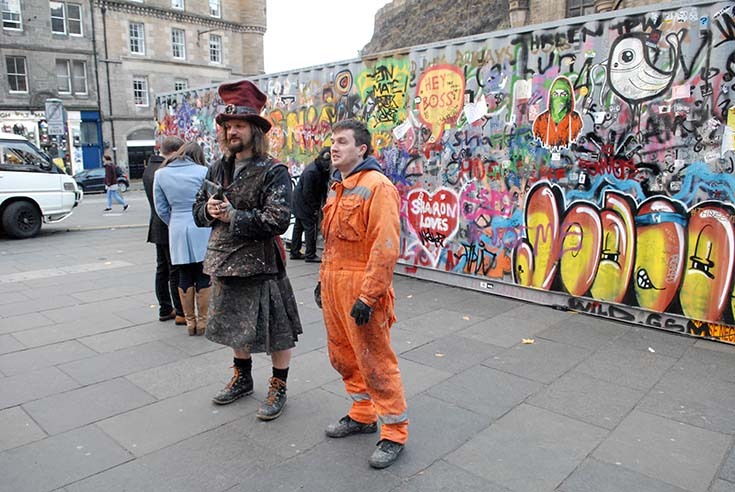 Ahead of the closing weekend of the ADP Riot Tour’s installation in Edinburgh, I was asked by the Greater Grassmarket Business Improvement District (BID) and events organisers Too Much Fun Club to paint a mural of the scene alongside renowned Scottish street artist and illustrator, Elph. 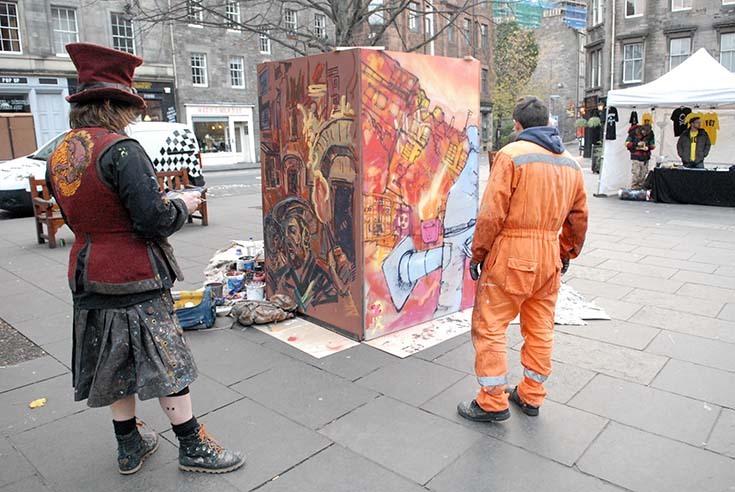 Working on connected octagonal boards, Elph and I engaged visitors to the Grassmarket as we worked on our separate but related public art works. Elph invited audience participation with hands-on painting by the public, and I convinced visitors to pose for portraits to be incorporated into the scene. 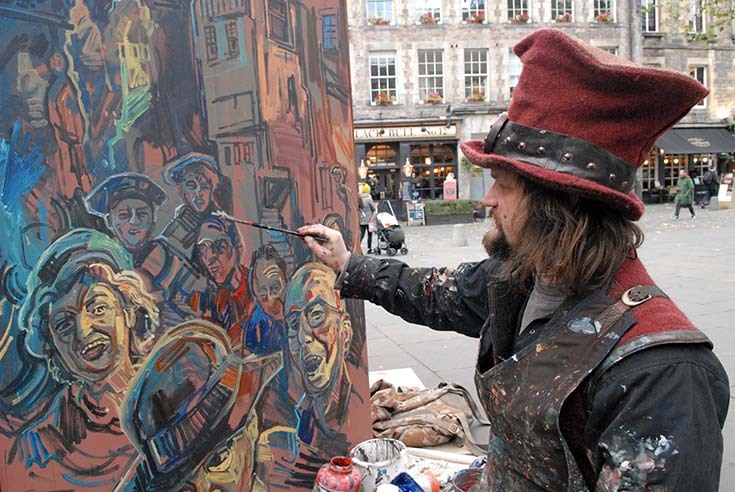 My crowd scene painting was inspired in part by James Drummond RSA who painted the riot in 1855. 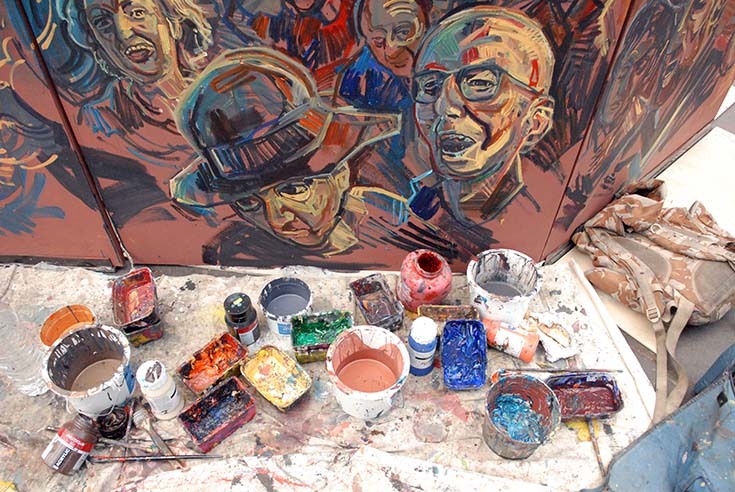 The detritus of live painting. Our pictures were situated back to back over the weekend and it was really great to have the two different styles complement and contrast one another and in an unintentional twist, even our clothes ended up matching our paintings. Artists Chris Rutterford and Elph with their artwork and unintentionally matching clothing. 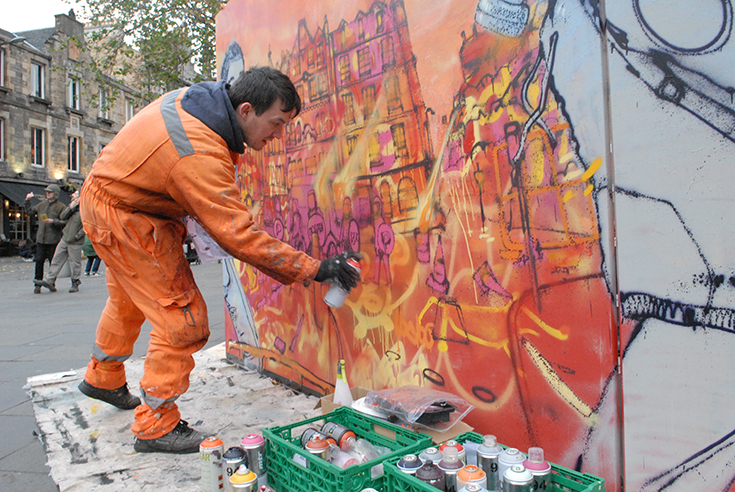 Chris Rutterford working on his Porteous Riots mural in the shadow of Edinburgh Castle.